Forbes: Who Will Lead In The Smart Machine Age? Conference Survey: Your input is needed! June 8th 2015. Please help us out by completing this brief survey about your interest in the conference. Connect with us on our Facebook event page. We’d love to see photos of your favorite moments from the 2013 conference! The Three Basic Psychological Needs by Richard Ryan and Edward Deci, demonstrated in this video from our friends at Camping Coast to Coast. From the 1999 SDT Conference…researchers convened at the University of Rochester to present their work, share ideas, and discuss future research directions for the theor. The Handbook of Self-Determination Research is an outgrowth of that important and fascinating conference. It summarizes the research programs of these social, personality, clinical, developmental, and applied psychologists who have a shared belief in the importance of self-determination for understanding basic motivational processes and for solving pressing real-world problems. “Nature is fuel for the soul. Often when we feel depleted we reach for a cup of coffee, but research suggests a better way to get energized is to connect with nature,” said the study’s lead author, Richard Ryan, professor of psychology at the University of Rochester. It’s not the video game per se that’s causing your rage; it’s the fact that you stink at it, says a new study from the University of Rochester. SDT research highlighted about gaming… A NEW study has revealed that gamers are more likely to experience feelings of aggression from playing a game when it is too difficult or when the controls are too complicated to master. “We focused on the motives of people who play electronic games and found players have a psychological need to come out on top when playing,” said Dr Przybylski. “If players feel thwarted by the controls or the design of the game, they can wind up feeling aggressive. “This need to master the game was far more significant than whether the game contained violent material. Released in April 2013, authored by SDT scholars Kennon M. Sheldon, Geoffrey Williams, and Thomas Joiner, Self-Determination Theory in the Clinic explains the ramifications of the theory and provides clinical examples to show that it can be used to motivate patients undergoing treatment for such physical or psychological issues as diabetes management, smoking cessation, post-traumatic stress, obsessive-compulsive disorder, and depression. Edited by Richard Ryan and published in 2012, The Oxford Handbook of Human Motivation collects the top theorists and researchers of human motivation into a single volume, capturing the current state-of-the-art in this fast developing field. The book includes theoretical overviews from some of the best-known thinkers in this area, including chapters on Self-Determination Theory, Social Learning Theory, Control Theory, Terror Management theory, and the Promotion and Prevention perspective. Published in 2012 by authors Jenny Ziviani, Anne Poulsen, and Monica Cuskelly, ” The Art and Science of Motivation: A Therapist’s Guide to Working with Children,” presents a groundbreaking, evidence-based model for working with children, including those with physical disabilities, learning disabilities and emotional and behavioural difficulties. Drawing on Self-Determination Theory (SDT), the authors describe this innovative paradigm – the model of Synthesis of Child, Occupational Performance and Environment – in Time (SCOPE-IT) – and explain how it can be used to sustain the child’s motivation and active involvement in the therapeutic process. 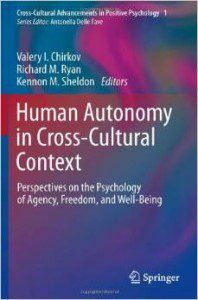 Released in 2011, edited by Valery Chirkov, Richard Ryan, and Kennon Sheldon, this volume presents the reader with a stimulating tapestry of essays exploring the nature of personal autonomy, self-determination, and agency, and their role in human optimal functioning at multiple levels of analysis from personal to societal and cross-cultural. The starting point for these explorations is self-determination theory, an integrated theory of human motivation and healthy development which has been under development for more than three decades (Deci & Ryan, 2000). Authored by Scott Rigby and Richard Ryan, “Glued to Games” was released in 2011 and brings the first truly balanced review of the psychology of video game motivation and engagement, based on years of research with thousands of gamers. The book addresses both the positive and negative aspects of game play by drawing on significant recent studies and established motivational theory [Self-Determination Theory] to explore the fundamental drivers of engagement, how games satisfy basic psychological needs, and how an understanding of these factors can be applied to controversial topics such as video game violence and game addiction. 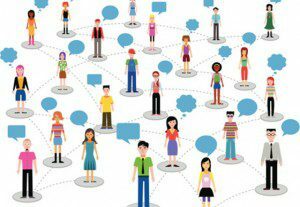 Self-Determination Theory noted in article about Relatedness without the use of Social Media. BBC: Does Money Really Motivate People? YouTube: Is Some Homophobia Self-phobia? ROCHESTER REVIEW: Self-Determined: What motivates you?